Its 2017 revenue target of $1 billion is looking increasingly out of reach. 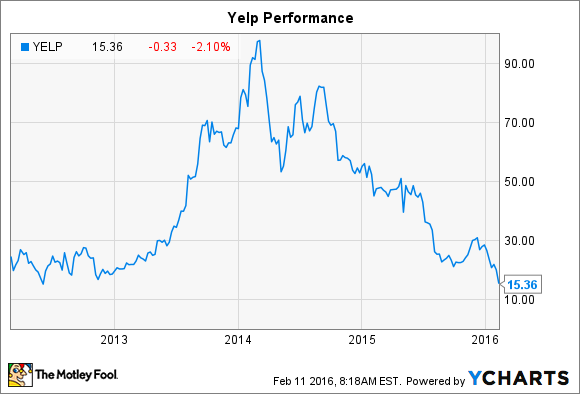 Yelp (NYSE:YELP) hasn't been this cheap in years. Shares of the local-reviews giant have fallen more than 15% since the company released its fourth-quarter earnings report on Monday, and are hovering near an all-time low. Yelp's results exceeded expectations: The company lost an adjusted $0.02 per share on revenue of $153.7 million. Analysts had been looking for Yelp to lose about $0.03 on revenue of around $152 million. Yet Yelp's rate of growth continues to slow. Meanwhile, CFO Rob Krolik plans to step down. Let's take a closer look at Yelp's report. Yelp has never been consistently profitable, leading investors to judge the company based on other metrics. Revenue makes the cut, as does user growth and customer engagement. All of these measures continue to rise, but not as rapidly as in the past. Yelp's revenue rose 40% on an annual basis in the fourth quarter. For the year, its top line increased by 46%. By contrast, in the fourth quarter of 2014, Yelp's revenue grew 56% compared to the year-ago period. And for all of 2014, revenue rose 62%. The bulk of Yelp's sales come from its local advertising accounts, which totaled 111,000 in the fourth quarter -- a gain of 32% on an annual basis. But in the fourth quarter of 2014, local advertising accounts rose at a rate of 48% from 2013. The value of Yelp's advertising depends on its users count and engagement. Reviews on the site rose to 95 million, a gain of about 34% on an annual basis. At the same time, the number of unique devices using the Yelp app rose 38% to 20 million on a monthly average basis. In terms of the mobile web, average monthly unique visitors to Yelp's website rose 14% on an annual basis to 66 million, while average monthly desktop visitors declined 4% to 75 million. Yelp has been shifting its emphasis to mobile -- in particular its app -- so the decline in desktop views is not particularly concerning. Yet, once again, all of these figures represent a slowdown from past quarters. The previous quarter, cumulative reviews rose 35% on an annual basis, app unique devices rose 39%, and average monthly mobile visitors rose 22%. At the same time, desktop views fell only 2%. Yelp's CFO Rob Krolik will depart the company sometime time later this year. He will stay on until his replacement is found, but will leave by Dec. 15 at the latest. Officially, Yelp stated that Krolik wants to spend more time with his family, but the departure may have been fueled, at least in part, by Yelp's recent underperformance. In the past, Krolik has offered long-term revenue guidance for Yelp of $1 billion, a target the company hoped to hit by 2017. That's still possible, but with Yelp's growth slowing, it probably won't happen. During the conference call following the release of Yelp's earnings, Krolik was asked about the $1 billion target. Rather than reiterate it, he stated only that Yelp would talk more about its 2017 outlook in the coming quarters. Yelp did offer guidance for 2016. The company expects to generate net revenue of around $154 million to $157 million in the first quarter, and $685 million to $700 million for the entire year. That would represent total revenue growth of around 26%. In order to hit $1 billion in 2017, it would then need to grow revenue at upwards of 40% next year. With that level of disappointment looming, it's not surprising that Yelp shares have tumbled.